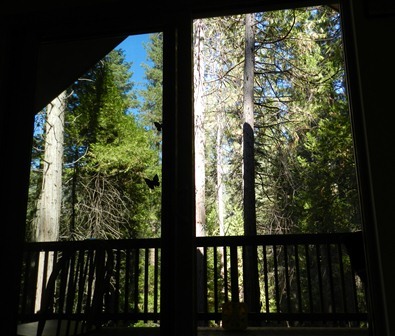 Waiting all day for a repairman to arrive in a paradisiacal place like Yosemite National Park – you know, just in case you were all wondering or anything like that – is no less annoying than waiting for one back home. Oh, the view from the kitchen windows is infinitely more gorgeous, but that’s about it. Long story short, the stove in the cabin blew up. Yeah, no joke. Manufacturer’s defect. Gas build up while cooking. Boom. I wasn’t there, mind you, but I assume it was rather spectacular sounding. Fortunately there were no injuries. So, now someone has to be here for the repairman and the Brown Footed Loons happened to be on the verge of migrating again so, voila!, we added an odd detour redundancy to our vacation so that we could wait in Yosemite – before heading to Cambria/Paso Robles for the Harvest Festival and then back to Yosemite for the rest of the week – for a repairman who never showed…yeah, Sears is now a 4 letter word in my house. While that was certainly a less than awesome start to our vacation – to put it mildly! – I’ll tell you what is awesome: baseball fans! Seth and I decided to give ourselves a treat on the way from Yosemite to Cambria and stop at a little steakhouse just outside the park we’d been dying to try rather than grabbing fast food. Well, wouldn’t you know it, this little steakhouse, it had a little bar. And in the little bar, it had a certain game on both TVs…and a large party of Giants fans, central California being no doubter Giants country, wearing their team gear with pride and rooting loudly. So we decided to kick it in the bar and catch a few innings. Best decision all day! The food was excellent, the wait staff friendly and the company could not be beat. We sat down just as Buster Posey struck out in the 4th inning. So we were there for what happened immediately after. Hunter Pence’s comebacker hit. Lance Lynn’s errant throw the bounced off the bag. And the Giants’ 4th inning scoring spree. The bar went from sedate to very loud indeed and, even after we confessed our Angels fan status, our cheers were welcomed into the mix. Baseball fans appreciate other baseball fans, especially come playoffs time. Except for a few inevitable bad apples I have found this to be true again and again, a point that was underscored when the rest of the local crowd showed up. This is a very small town and this bar seems to be one of the preferred places from which to catch the game. Four local Cardinals fans wandered in wearing their team gear with pride, clearly transplants from a more birds on bats part of the country. The Giants fans at the bar and the Cards fans greeted one another warmly and, when there wasn’t quite enough room at the bar for everyone, seating arrangements were shuffled about to make sure the new arrivals weren’t sitting at nearby bar room table by themselves. All very companionable and sweet. Like I said, baseball fans are awesome! The game itself was a breath of fresh air in what had previously threated to be a dull series. Sorry, Cards and Tigers fans, but sweeps and near sweeps are only desirable if you’re an existing part of the fan base of the team doing the dominating. For the rest of us, especially after getting thoroughly spoiled by the wild, tightly contested wonderfulness that was the Division Series X 4, quite frankly, the ALCS was kind of a let down and the NLCS looked like it was heading that way. Yeah, I was rooting for the Tigers in the ALCS, but I rather hoped the Yankees would put up a fight. I get that Derek Jeter’s injury was a crushing blow to team morale, but even before that they were not themselves. Fortunately for baseball fans everywhere, especially those of us watching purely for love of the game, the Giants rallying after two straight losses to shut out the Cardinals and take Game 6 saved the NLCS from a similarly ho hum fate, no matter what happens tomorrow. And it was great to see Barry Zito going retro, channeling pitches from his own more lights out era. I love a good comeback story. They’re one of my favorite parts of the game…along with taut pitchers’ duels, stellar defensive plays, ballsy steals, and diverse groups of great fans coming together to bond over our shared love. I know, I know. It doesn’t sound the same without the Angels at all. But what’s a fan to do? Ignore the post season? Go into deep mourning every Friday night? I think not. So consider this Friday Gourmet: the Post Season Edition. And I have to say, even though I was sorely missing the Angels, having two excellent games for my viewing pleasure did make for a most enjoyable Friday. How cool is it that three of the four LDS match-ups went to Game 5 and all four match-ups were decided by 1 run? Pretty darned cool and extremely exciting. Suffice to say, this post season we’ve seen some good, close matchups. I’ll admit it. I started my Friday a little early and snuck in the last two innings of the D-Backs game while I finished up a few things for work…hey, I also finally shut down the work laptop at home on Thursday just shy of midnight, so I think they still came out of this with the majority of my attention. 😉 What a good game! I wanted the D-Backs to win. But it was so close and everyone played so well, that they should certainly go home with their heads held high and rest up for next season when I have no doubt they’ll pick up right where they left off. (Though hopefully a rebuilt Dodgers team with spanking new owners will give them a run for their money and wind up in the top spot. Sorry Gibby. That’s just the way it works with me.) And, in the meantime, Congratulations to the Brewers! At the same time I was sorry to see the D-Backs lose, I was also pleased to see these guys win. Hey, it’s the post season. That’s allowed. Yeah, I was cooking a little towards the beginning of the game. It was Friday after all. I baked a spicy chili, cheddar bread and toasted up thick slices of it with turkey, thick slices tomato, slivers of onion and homemade cheddar garlic spread melted over the top. Paired with a gorgeous Muscat Canelli from Eberle it was really, really good if I do say so myself. Yes, paired with a sweet wine. Okay, you’re forgiven for making that face. You’ve probably only ever had sips of some ghastly sugar bomb like Beringer’s White Zinfandel or the like before. Trust me, it’s all about balance and a good sweet wine paired with something pungent and earthy like blue cheese or camembert, or with something spicy like Thai food or, say, a sandwich made with bread that includes a fair bit of fresh diced jalapeño, and it is a thing of beauty. And, hey, an evening in with good food, good wine a great game? It doesn’t get much better than that. Would that this evening’s ALCS game had been as good. I would be willing to be that Verlander could have recovered his command given a few more innings in a row with no rain delay, but that may or may not have been enough. And then after the first rain delay it was C.J. Wilson’s turn to get a little sloppy, but not enough so for the Tigers to take the lead. Oh well. That’s only the first game. So, tomorrow. Bike ride. Minor chores. Then brunch eventually and a heck of a lot of baseball, possibly accompanied by the Tigers friendly Rio Seco wine. (Rio Seco’s winemaker played in the Tigers minor league system) Now, who the heck am I rooting for in the NLCS?? I like ‘em both and would enjoy seeing either in the World Series, so that is the question of the evening. Any thoughts?